We have, at last count, 335 questions tagged vagrant. Should Server Fault accept questions about Vagrant? I would say yes. Systems administrators can also use vagrant for testing our own environments. Say you want to test your puppet manifests against a known standard configuration - you could vagrant up an entire testing system environment. Additionally, part of a systems administrators job is supporting the systems that the staff use. Vagrant still falls within this scope. So a blanket ban on vagrant is not a good idea. As with most things, looking at the question in-context before making a decisions is the way to go. I believe that Vagrant fits these three requirements. It's software for workstations, it's a tool for automation, and it's about deployment and management of third party technology platforms! It is none of those things either. This is a topic I've been mulling over for quite some time, and I'm not sure I have a good answer. The vast majority of vagrant usage is by developers, orchestrating development environments or to otherwise automate the handling of VirtualBox VMs. Yes, vagrant can be used with vSphere or any number of other public clouds, but as womble mentioned, it fails on many accounts to provide meaningful functionality in those environments outside of development. Vagrant can be used for all of these, and can accomplish the tasks in a 100% programmatic and repeatable manner, which is where the value comes from. To sum up my views on this, it would be silly to take a black-and-white stance on this. Like so many topics on Serverfault determining topicality requires a bit of nuance. We need to examine whether or not the OP is using vagrant for appropriate purposes as part of their professional systems/network administration job. If so, and if it's a good question, then I will welcome it. It's kind of the same as VirtualBox or *AMPP. If you are preparing/deploying for other people then yes, on topic. Otherwise you are running close to development and SO is likely a better place. It's not like they don't have a body of vagrant knowledge, they have 4000+ questions tagged as such. Sure we can and do use vagrant for a variety of sysadmin tasks but the majority of questions we see clearly don't fall into that category. 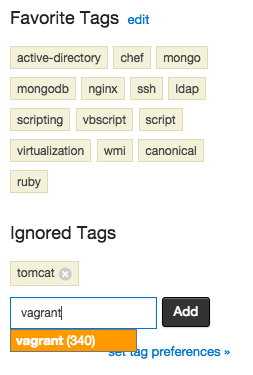 If a SysAdmin has a question regarding Vagrant, it will probably be on-topic. Like Mark Henderson states, it may be used by Sysadmin to test a configuration management and many more scenarios. However, if a end-user comes and ask a question, then he thinks SF is his SysAdmin and he is asking a user question to a SysAdmin group hoping some sysadmin will kindly do the missing job in his business. Or his question is more pertinent to other developers to answer. So I think it comes down to the usage scenario, not the particular software/tool. I've tossed enough comments in so I thought I'd summarize my arguments in one place. in an ideal world I'd agree with you. In an ideal world we'd not need money we'd all just seek to better ourselves and each other. In the world we have, people have to make decisions, and instead of whatever feels right there should be a guideline. That guideline is currently fairly exclusive. As an example if you even mention the word home in a question, even if it's a very good DNS question that an admin in a business would in fact do, it gets migrated to SU. If it's something that a user could do, even if an admin would also do it, it's been migrated. This completely makes sense to me since we are trying to attract experienced professional admins. I certainly agree that we should not be looking a products/solutions/tools on a product by product basis and I think that we could consider changing the FAQ to "questions from professional admins" as opposed to a professional capacity in a business. I say this as a frequent user of Vagrant, and as someone who develops Vagrant-based (dev) systems for others to use: I think Vagrant, in general, isn't on-topic for SF. It really isn't a systems management tool. I've seen a few people try to use Vagrant as their "cloud orchestration platform"; it goes about as well as you'd think... that is to say, not at all. It's true that it can be used by sysadmins to create ops testing (and training) environments, but just because a sysadmin uses it doesn't make it a suitable topic for SF (otherwise whiskey would be a top-voted tag, no doubt). A topic of an useful, healthy, friendly site should be interpreted as wide as possible, and should always contain what is the "common sense". It is because new people won't know all of the relevant meta posts about the site topic, years retroactively. In most cases, they don't even know that a meta site exists. And closing - destructing their content isn't a happy first experience. With their loss, the site loses all of the content as well, what they could have constructed later. The content of the site should be filtered by quality, and not by an irrationally narrowed topic. It is especially bad thing to use rules retroactively, it is the worst of all worst. Going years back on the site and deleting hundreds of questions on newly invented rules, it is simply... sulphuric, on my opinion. Instead of it, if such an intent comes forth, first it should be discussed, what is the real reason. It is highly unrealistic, that something were about professional system administration years ago, and now it isn't. If you now want to kill year-old content, then something is nearly surely not okay. Second important thing, that for such cases there is a healthier solution: using a tag with "historical" or similar name, to differentiate the old, but once allowed content. First, constructing environments by Vagrant is a border case between the development and the administration. It shouldn't be offtopic, especially not on SO and SF, it should be ontopic on both sites. I don't think that a little bit of overlap with the SO would be a problem or even harmful. There is a lot of cases where professional software developers need to work in environments constructed by system administrators for them. The difference between our common skills and viewpoints, it is big and highly visible. And, honestly, it is not always a good experience if both of us need to maximize our work quality, but on different measurements. Having "vagrant" content on the SF would be a help to build a bridge between the worlds. On my opinion, this is what should be done, but unfortunately the well-known, SE-wide disdain of the mods from the question migrations probably avoids the migration part. But destroying content retroactively, it is always bad and it could be avoided. I say we answer them. I use Vagrant for testing my config management and other automation tooling all the time. I use it to provide a prod-like environment on which the dev teams can test their code so I don't have to hear "it works on my machine". I use it to evaluate new tools without having to install it on the shared-infrastructure (which - depending on your environment - may incur additional work or cost). If you don't want to answer them, then dont. If you don't want to see them, add a filter.